法國, 澳洲, 美國, 南美等紅酒大家飲得多, 西班牙紅酒大家又試過未? 為大家帶來的是於 Mundus Vini 2009 及 於 2008 及 2009年 Concours Mondial De Bruxelles 取得金獎的 的 Megala 及 Ben ali有機紅酒. 詳情可下載下圖, 電郵或致電本公司. Would you like to try some Spanish Wine? 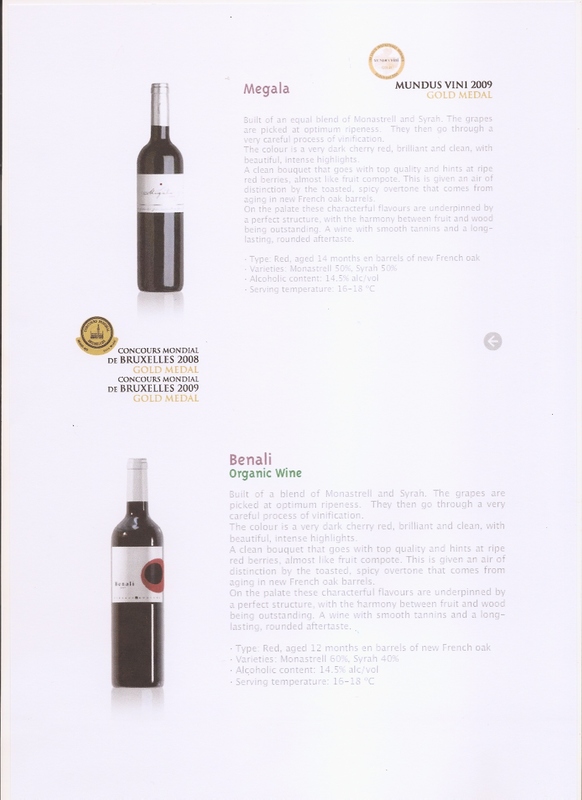 We proud to bring Megala and Benali (Organic Wine) to Hong Kong Market, Megala wins Gold Medal in Mundus Vini 2009 & Concours Mondial de Bruxelles 2008 / 2009. For further inquiry, please kindly download the following or contact us though Email or give us a call.